Pete Gould’s annual Music Quiz took place last night. After last years tricky sets of questions, he had been asked to make it simpler this time, which he assured us all he had done! Linking his computer to the Club sound system proved to be the first test, which was eventually passed and after that the well filled Clubhouse settled down to an entertaining evening. Well done to the prize winners, the team named ‘The Cunning Plan’ which included ex Captain Trevor Parrett and his guests. Close runners up were the President’s team in which an energetic Gary Griffiths appeared maybe to be the main contributor to their answer sheet? A big thank you goes to Pete and Kate Gould for their time setting up the Quiz and also to Steve and Donna for the catering provided at the interval. 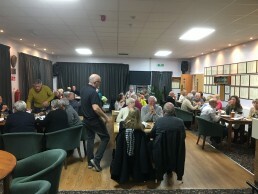 Over £100 was raised for the Social Committee Clubhouse improvement funds.